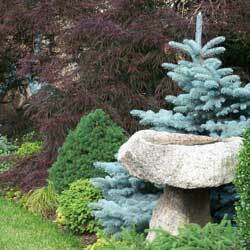 Dwarf conifers are some of the most versatile and popular plants of today’s modern garden and landscape. These fantastic plants add interesting texture, color and form to rock, pond and container gardens as well as any type of mixed border. They come in a variety of cultivars of different sizes and growth habits, and more cultivars are being introduced all the time. 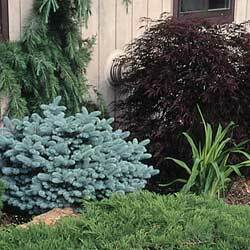 Dwarf conifers are virtually carefree and often provide four seasons of interest. We commonly think of conifers as needled evergreens such as pines, spruce and firs, but not all conifers are needled and not all are evergreen. The common larch is needled, but deciduous. Ginko trees are conifers that have fan-shaped deciduous leaves, and this tree is neither needled nor evergreen. What identifies a plant as a conifer is that it is cone-bearing. Dwarf conifers are slower growing and smaller versions of the straight species of a given conifer. A good example is the Eastern White Pine, Pinus strobus, which can reach a height of 100 feet at maturity. The dwarf version of this plant, Pinus strobus ‘Nana’, will only grow to eighteen feet at maturity, but other than its size, it shares all the charming characteristics that are so well loved about the full-size tree. Not sure which of these or other amazing dwarf evergreen conifers are best suited for your landscape? 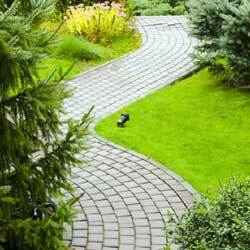 Let our experts help you choose a beautiful tree that will be a standout however you may use it in your yard.